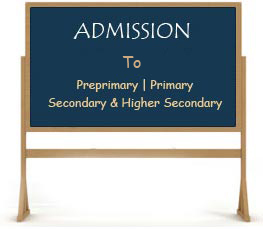 Admission to the school is subject to certain Government regulations and by conditions of age, ability and conduct. Admission shall be finalised, only when original school leaving certificate from the previous school is submitted to the school. It is essential that the students coming from the other stales of India should have their school leaving certificates duly countersigned by the appropriate educational authority. The principal reserves the right to refuse any admission without having to assign reasons for his/her action. Parents are required to make a written application for the transfer certificate of a student one week in advance. The school leaving certificate (L.C.) shall be issued only after all school dues are paid in full. A duplicate L.C. will be issued only after an affidavit is produced and by paying Rs 25. A student who is absent for 90 working days without previous permission from the Principal or without sufficient reason will have his/her name struck off from the school register. Irregular attendance, habitual idleness, disobedience or defiance of authority or conduct affecting the moral code of the school are sufficient reasons for the suspension and the dismissal of a student.